Hello, I'm back again! I finally broke down and bought a set of PTI's flower dies, needed something to use up the felt I've been collecting!!! ;0) I went with a CAS layout to showcase my Flower, I like these bright colors together. Thanks for stopping by. List of challenges and supplies used is below. thks for playing along this week at Stamp Something.. love it! Love the CAS card and the wonderful bright flowers! Beautiful Card, so clean and simple I love it!!! Thanks for joining us at Stamp Something this week for our "Something Flowery" Challenge. Great CAS card and summer colors. Thanks for joining us at For Fun this week. Gorgeous card!!! Love the flower! Fabulous CAS card. Great colours. Thanks for entering into the For Fun challenge this week. 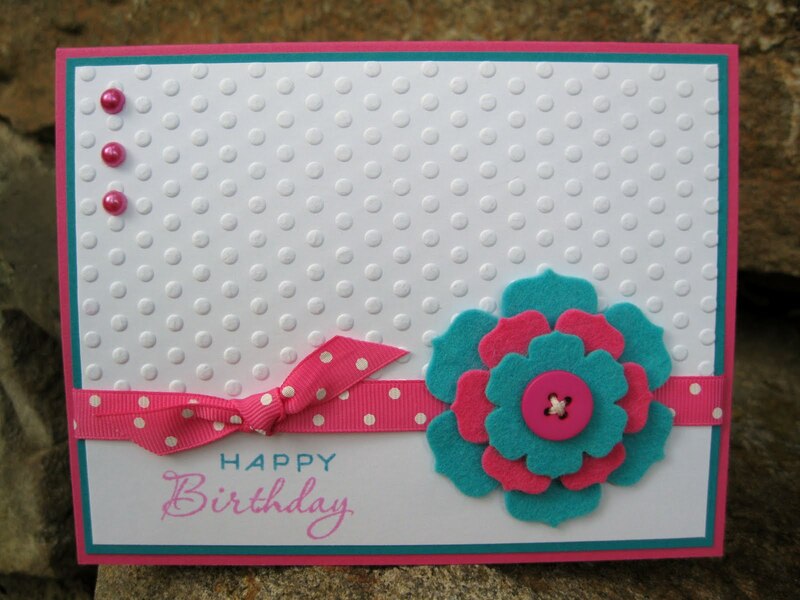 Gorgeous card....LOVE those colors! Thanks for playing along with us at For Fun!